Product Description Laboratory Model Freezing Point Osmometer for both 0.2 and 2.0 mL samples. Automatic digital osmometers measure osmolality in mOsm/kg H2O. 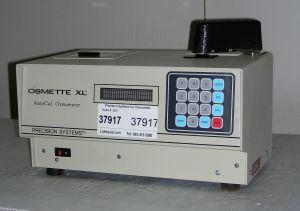 Precision Systems Osmette XL Osmometer uses the freezing point depression method to provide a quick, accurate indication of total concentration. Instruments measure freezing points of solutions to 0.001°C, then directly translate them to measure of concentration. What type do you need: vapor pressure, freezing point or colloid?